Early Wednesday afternoon, Joan called to inform us that there was a Pekin in a trailer park in Mt. 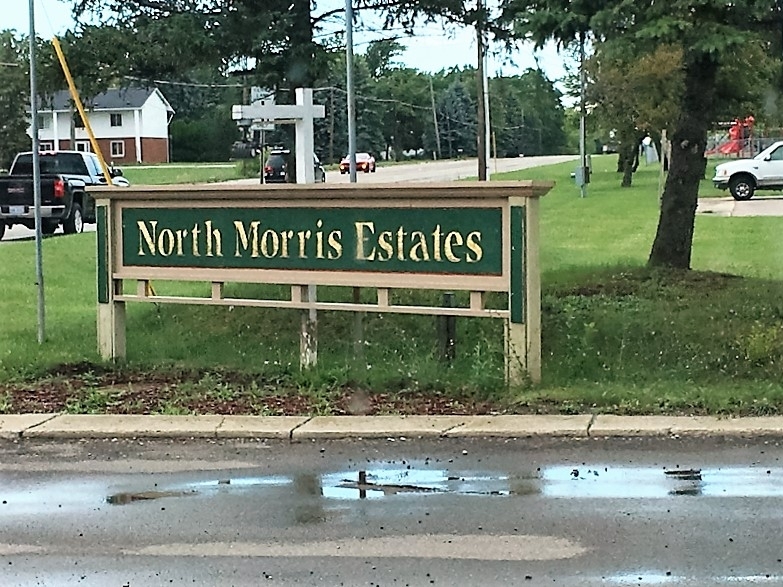 Morris, just north of Flint, that was in dire need of rescue. Apparently, half of her upper bill was gone. 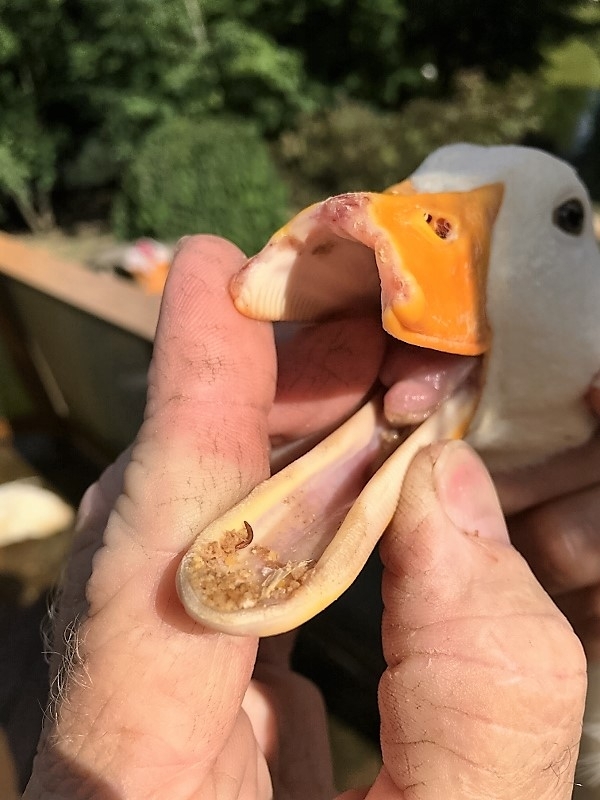 I called the management of what appeared to be a somewhat desolated community, and they were very adamant about only allowing us to remove the injured ducks. We left immediately, before they changed their mind. I was told that they had domestics there for years, and they were fine, they may have been there for years, but they are not fine. Well, once inside the property, we made our way to the fenced-in pond, where there were several other Pekins and a lone, and beautiful, Toulouse goose. Since the area was fenced and secured with a padlock, and no one was there to let us in, we had to jump a small fence. 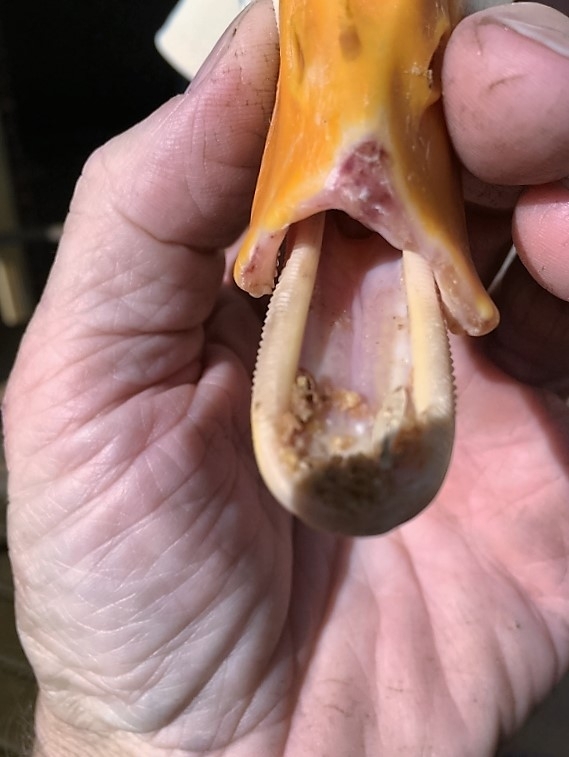 We quickly caught a Pekin that had definitely been mauled by a Snapper Turtle, and whose foot was half gone. Then I had to fetch the kayak and chase down our intended ‘victim’. She hid under a treed overhang near the shore, but it was only a matter of time before she would be coming home with us. Once home, and after our work-up, it was easily noticed that both angels were completely infested with poultry lice, and after a quick dusting, they just ‘poured’ off of both of them. 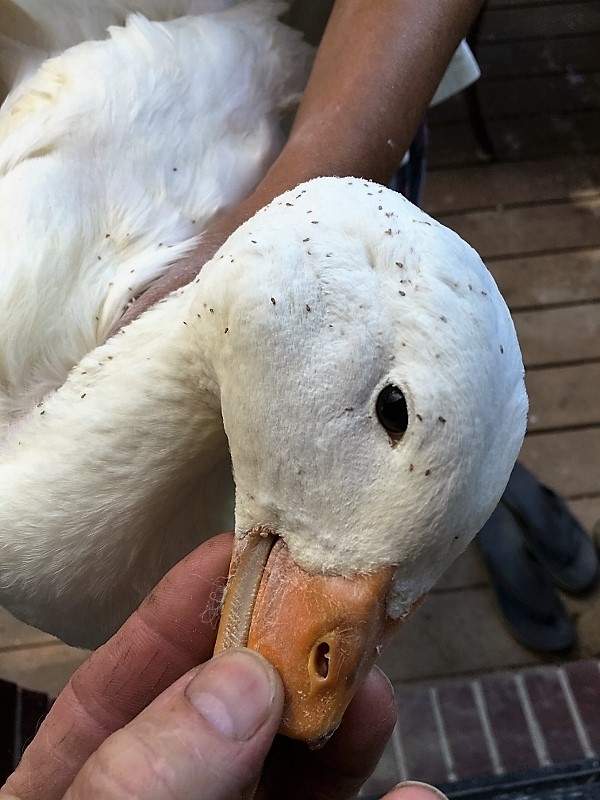 Poultry lice usually finds its way onto the more injured ducks, but by no means exclusively, and then it will eventually beat them down over time, literally, to death. It will wear down its hosts to a point where they can’t even sleep, due to the constant irritation. The little female, who we now call Joni, weighted in at just over three pounds, just about half what a healthy hen should weight. Just over half of her upper bill was gone, along with most of her tongue. It would be impossible for her to eat grass, go grubbing, and scoop up random food, or whatever people were feeding her there, and it was definitely NOT healthy. They were only being feed by seldom visitors to the pond, and not the management, which should have been solely responsible for a complete and healthy, daily diet! Currently, Joni is being hand fed, and is eating like there is no tomorrow! I had mentioned Doug in this title for a reason. You see, I had befriended Doug Peterson at the Brighton Mill Pond just a few short years ago. We both shared a similar fondness for nature, especially waterfowl, and even more so, abandoned domestic ducks. 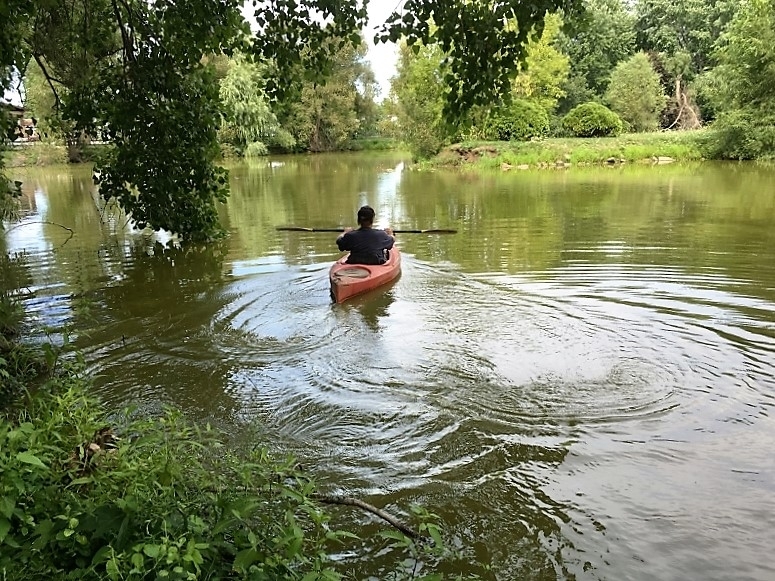 Over the years, prior to our acquaintance, Doug studied the Mill Pond without exception. His continuing blog, words4it.com, kept the locals, and others as well, informed about everything at the pond. Every new hatching, every life, every death, and sometimes, every new bloom on every flower. He knew that pond, and everything that went on there, like I know our Sanctuary, and there’s a whole lot more to know there, than here. We shared our stories and experiences regularly, and we would head there in an instant if he ever needed us. I learned more from him than he could ever learn in return. He was also always extremely generous with his time regarding any issues I might ever have with our website, you see, he designed that too! We would sometimes talk late into the night, and still leave stories unfinished. His is a friendship I will sadly miss, and he will always be with us, and all of our duck ventures, in spirit. 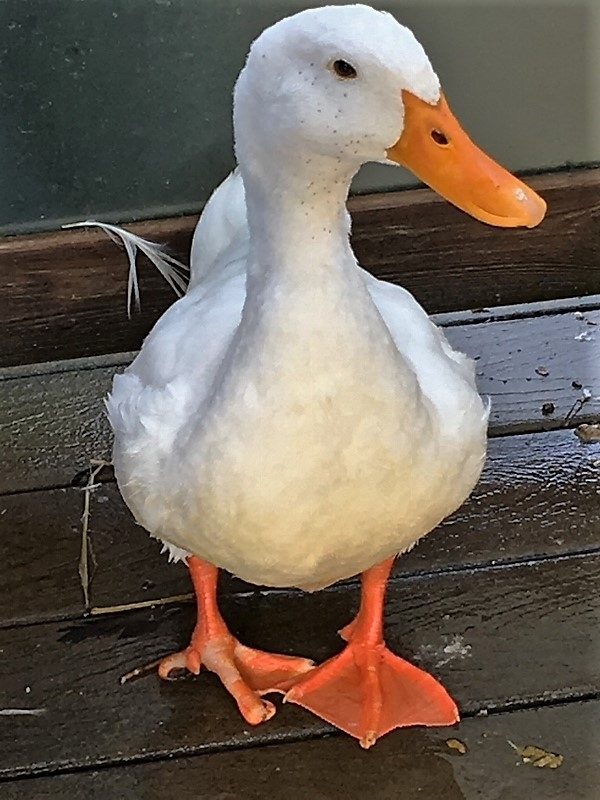 Some of you might remember our rescue at the Mill Pond about two months ago, when Theresa and I went back to the pond around midnight, to rescue the final three ducks of four that night, including Joy, with the mangled foot (the others were named, Peterson, Doug, and Hope). I had called Doug just about an hour before leaving to let him know about the situation, and what we were doing, so he wouldn’t suspect “fowl” play. He never answered, nor returned my call, which we both thought unusual. Well, it was the next day that we sadly learned of his passing the day before. We were beyond words! The Wednesday of this latest rescue, there was a remembrance gathering at the Mill Pond in his honor, but unfortunately, Theresa and I couldn’t make it because of this rescue…And I know in my heart, Doug wouldn’t have wanted it any other way. Fact is, I’m sure he would have ‘cursed’ me had I done differently! That was Doug, a wonderful man, a free spirit, and a lover of nature! I may shed one less tear down here when ours eventually pass, knowing that you’ll be sitting on a bench, under a shading tree, by the Crystal Pond, greeting them all, as they arrive up there!